According to a USDA announcement on October 10, no marketing quota and no acreage allotments will be in effect for the 2019 upland cotton crop. The Agricultural Act of 2014 authorized commodity programs for the 2014 through 2018 crop years. 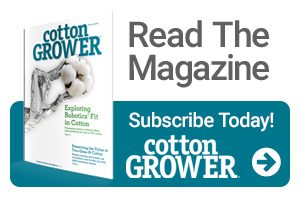 Unless superseded by new legislation, any actions taken by USDA pertaining to the 2019 upland cotton crop must be done in accordance with the Agricultural Adjustment Act of 1938, as amended (the 1938 Act), and the Agricultural Act of 1949, as amended. Those laws require, under certain market conditions, the announcement of marketing quotas and acreage allotments for upland cotton by October 15, 2018. The 1938 Act requires a marketing quota be established for the 2019 upland cotton crop if the 2018 total supply of the crop is likely to exceed the normal supply of the crop. Normal supply is defined as the sum of total domestic and export use, plus carryout stocks equal to 30% of combined domestic and export use. Based on USDA projected supply and demand for the 2018 cotton crop, no quota and no acreage allotments are required for the 2019 upland cotton crop.